Uncover preferred styles of verbal and nonverbal communication with the fast and fun What’s My Communication Style? Using a 24-item inventory, participants will learn their preference for one of 4 communication styles, recognize the various facets of communication, and learn how to use their own style to enhance communication. Communication is the very lifeblood of any organization. And effective communication skills are the building blocks for what is commonly referred to as “people skills.” If managers cannot communicate clearly and persuasively with employees, and employees with customers, then other vital goals are forever out of reach. Say goodbye to aspirations for capable leadership, teamwork, customer service, or even the ability to execute a coherent business strategy. If you want to bring about meaningful improvements in communication skills, the best way to begin is to build a better understanding of personal communication styles and their effects on others. What’s My Communication Style is a proven training assessment that identifies an individual’s preferred style—Direct, Spirited, Considerate, or Systematic—and the communication behaviors that distinguish it. 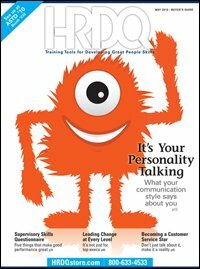 Part of the best-selling HRDQ Style Series, the assessment and its supporting materials provide a practical and easy-to-use “language” that enables lasting insights into how to gain mastery over one’s own communication behavior and how to interpret the behavior of others—in any situation. What’s My Communication Style is a powerful centerpiece for management development and interpersonal skills training. Pinpoint one of 4 communication style preferences, Learn about 4 forms of communication. Discover how style affects communication. Learn how to “speed read” a person’s communication style. Understand how to “flex” style for effective communication with others. What’s My Communication Style is appropriate for anyone to use for both personal and management development. The assessment can be used as a standalone training assessment, or it can be incorporated into a more comprehensive training program on communication skills. It makes an effective foundation component for a variety of soft skills training topics, including communication, leadership, team building, and supervisory skills. What’s My Communication Style starts with a self assessment that takes approximately 10 minutes to complete. Individuals respond to 24 different items relating to both verbal and nonverbal communication by selecting the statement ending that they believe best reflects their perceived communication behavior. Scoring the responses provides individuals with a total score for each of the four personal communication styles: Direct, Spirited, Considerate, and Systematic. The majority of individuals will show a clear preference for one of styles, which is their Dominant Style. Have you ever felt like you “hit it off” with someone – maybe even after knowing him or her for just a short period of time or discovering that you have very little in common with that person? Still, you just sensed you would get along, despite the reasons why you shouldn’t. Now turn it around. A friend introduces you to someone they just know you’ll love. Or you meet someone that you expect to like immediately. Yet you’re surprised when you dislike them right off the bat – or you’re indifferent to that person, at best. So what's going on and why does this phenomenon happen to all of us? Rapport. Join us for a free webcast, The Dynamics of Rapport: Using Neurolinguistics to Improve Communication. Jim Eicher, neurolinguistics expert and author of the Neurolinguistic Communication Profile assessment, will lead you through the fascinating and dynamic world of rapport. He’ll explore every phase, from developing rapport to turning resistance into irresistibility. A well-respected author and consultant, Jim Eicher is a subject matter expert in the fields of sales, organizational strategy, leadership, and communication. During his career, he has held leadership roles at Booz Allen Hamilton, Andersen Worldwide, Symantec, and NetApp. He was also the founder of Cognitive Management, a training and consulting with worldwide clients such as Xerox, Reuters, Sony, Simon and Schuster, Amdahl, and Nortel.